The 38th Bomb Group called Horn Island, located north of Queensland, Australia, home in September 1942. Perhaps home is too strong a word. While staying at Horn Island, the men put up with high heat and humidity, hordes of mosquitoes, bad food, lots of dust and a water supply that was tainted with magnesium sulfate. It was not a pleasant area. In the event of an air raid, all planes were to take off in order to keep damage at a minimum. The dusty conditions significantly hindered pilot visibility, making takeoff very risky. The two runways on Horn Island formed the shape of an ‘X’ and each had a small cutout where pilots of two planes could wait for their turn to taxi to the end of a runway and begin their takeoff. 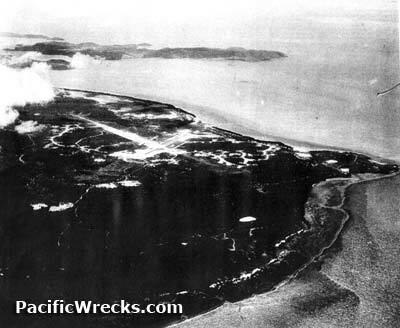 Horn Island in 1942. Photo from PacificWrecks.com. September 25, 1942 brought a Japanese raid to the island, sending crews running to their planes in order to get them airborne fast. 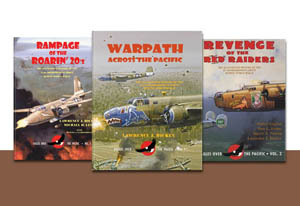 At the time, the 49th Fighter Group was also staying at Horn Island, leading to even more chaos as both P-40 fighters and B-25 bombers began to crowd the two runways. 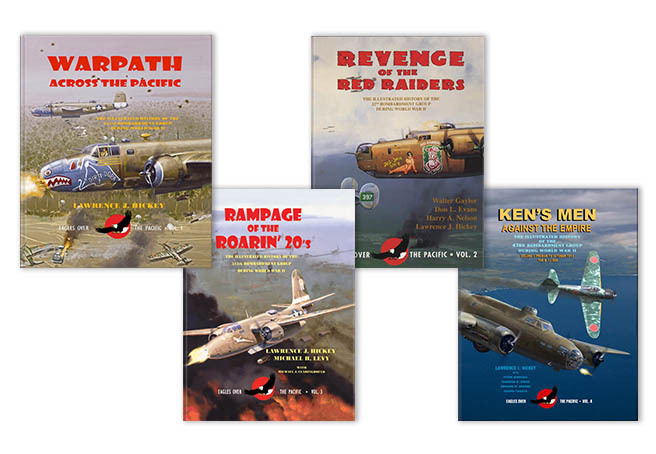 In the midst of the hubbub was the 405th Squadron’s 1/Lt. William F. Pittman and his crew hurrying to get their B-25, SUICIDE’S FLYING DRUNKS off the ground. Pittman taxied to the end of the runway, then turned around to take off. Because of all the dust that had been kicked up as he taxied, he couldn’t see whether or not the end of the runway was clear. At the same time, a P-40 was taxiing in the opposite direction on the same runway. When Pittman hit 90mph, he exited the dust and saw a collision between his plane and the P-40 was imminent. Yelling for his crew to hang on, Pittman and his co-pilot, 2/Lt. Dean G. Hall, managed to get a few feet off the ground, with the left landing gear rolling over the top of the P-40. 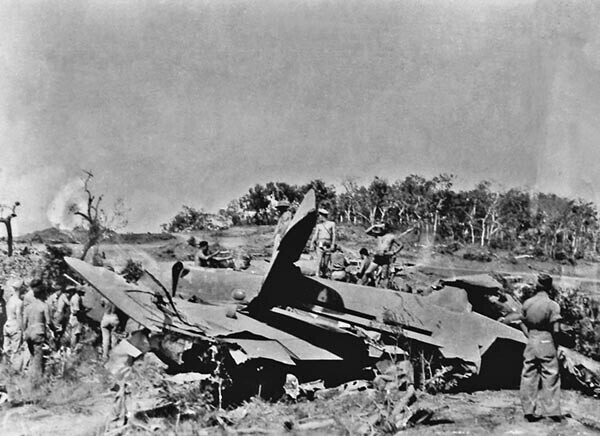 The left wing dropped as the B-25 flew through the camp area, leaving a path of destruction in its wake. Even though Pittman leveled out, SUICIDE’S FLYING DRUNKS was not going fast enough to avoid a crash and the pilot quickly began turning off the engines to prevent a fire on impact. As he turned off the engines, the plane crashed, throwing the crew around. At the time of the crash, bombardier 2/Lt. Joseph R. Petronis was wearing a steel helmet that probably saved his life; he walked away uninjured with a large dent in it after hitting a bulkhead. Luckily, no one was seriously injured in the crash. SUICIDE’S FLYING DRUNKS was a total loss. After the 312th left Hunter Field, they moved on to De Ridder Army Air Base, which was approximately 50 miles north of Lake Charles, Louisiana. While living at this smaller base, the 312th learned more about supporting ground units in combat. Through this training, they realized how much they needed to work on coordination between operations, intelligence, and communication personnel. Aircrews practiced various dive-bombing techniques and small groups of pilots and intelligence officers spent time with Army units learning about their strategy and tactics. The Group stayed at De Ridder until they received orders on March 27, 1943 to pack up and move to their next base, Rice Army Air Base, in southern California. It took about two weeks for them to get everything ready for the cross-country trip. During this time, the Group had to deal with their first and only loss at De Ridder: 1/Lt. Elmer R. Cawthon had climbed into an A-24 for an unscheduled flight after leaving a gathering at the Officers’ Club. Cawthon’s plane never returned to the base. The plane wreckage was found near Camp Polk and it appeared that the Cawthon failed to pull the plane out of a steep dive. Once at Rice, the Group discovered that the living conditions there were a far cry from the comforts they first experienced at Hunter Field. 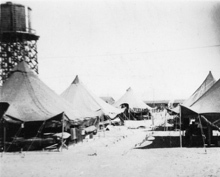 Here, the men lived in tents and endured desert temperatures of over 120 degrees. They couldn’t work between 12:30 and 5:00pm because planes, tools and vehicles were too hot to touch. At Rice, the 312th’s training included lectures and drills with weapons instruction to sharpen their soldiering skills. While practicing the dive-bombing, the crews got bored bombing disks painted on the sand, so they scrounged around the desert and found abandoned cars from the 1930s. They also practiced attacking railroad centers, crossroads, and supply areas to improve their navigation and bombing skills. In April, the 312th received their first Curtiss P-40 Warhawks. 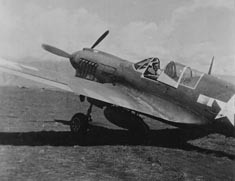 The A-24 was weak against the Japanese Mitsubishi A6M “Zeke” fighter in combat, so the group transitioned to the P-40. This single-seat, single-engine plane had six .50-caliber machine guns in the wings and held a 500-pound bomb under the fuselage. The pilots had to get used to a few differences when flying the plane through a bombing run. There were no dive brakes, so pilots would reach nearly 500mph in a near-vertical dive. When approaching the target, the pilots had to quickly pull out of the dive and this was a very dangerous task. They switched from dive-bombing to glide bombing to keep planes at a 45-degree angle. While sorting out the differences between the two planes, the crews had a couple of other problems to deal with. The intense heat at Rice caused the P-40 engines to regularly overheat and the rubber on the landing gear to soften when the planes would land. Sand covered the runways and abraded the tires on landing. Because of this, P-40 tires were only good for about six landings. In May, the 312th lost two members of the Group. 2/Lt. James N. Goe was flying an A-24 and demonstrating dive-bombing to his passenger, 1/Lt. James P. Matthews, when the plane inverted as it was coming out of the run and crashed into the trees. By the time July rolled around, another move was imminent. This time to Salinas Army Air Base, 400 miles northwest of Monterey, California. At the new base, the 312th would have to work harder for proficiency in flying and maintaining the P-40, something they didn’t quite pass at Rice. The Group was happy to be out of the scorching desert and back in the barracks at Salinas. Of course, the men were kept busy learning interception tactics and taking part in military training. While at this base, the 312th lost two more men. On September 12th, 2/Lt. William H. Gillette was flying a P-40 near Point Sur when he collided with another plane. Both pilots bailed out, but Gillette died of hypothermia. A week after Gillette’s crash, 1/Lt. Jay E. Gowers died when his P-40 crash-landed at Stockton, California. In September the Group started to prepare for the overseas voyage that would soon come. The 312th marched and hiked, practiced first aid, learned how to move up and down ship ladders and were taught censorship regulations and emergency procedures. 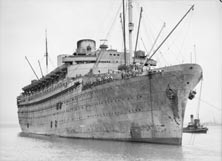 On November 1, 1943, the Group left San Francisco aboard the S.S. Nieuw Amsterdam. They didn’t know where they were going until close to the end of the trip, but they knew they were heading to war.